our little fur baby is obsessed with one particular bright pink ball that he has. almost every day like clockwork, he picks up the ball in his mouth, yells at it, and plops it down in his water bowl. we reset it every night so that he can redo it the next morning. 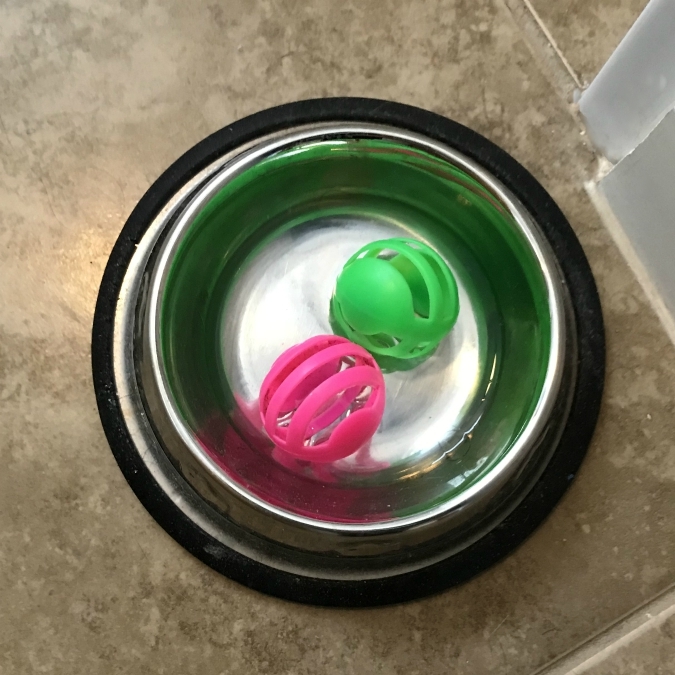 a few days ago, i came home from work to find not only the pink ball in the water like usual, but leko's green ball was joining the pink ball for a swim in his upstairs water bowl in our bathroom! it was such a rare occurrence that i quickly snapped a picture on my phone and texted it to ryan. How cute, pink ball now has a friend to go swimming with. If green ball liked that, this may be a daily occurrence. Was Leko celebrating St. Patrick's Day a bit early with his green ball?